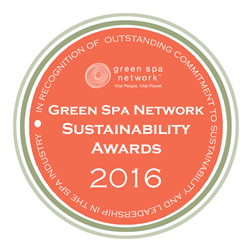 American Spa Magazine to sponsor the 2016 GSN Sustainability Awards for the spa and wellness industry. Having had the honor of being on the judging panel for the GSN Awards in the past, I am thrilled to have American Spa magazine and Questex play a bigger role with GSN this year” says Julie Keller Callaghan, editor-in-chief and publisher of American Spa. American Spa Magazine and the Green Spa Network (GSN) have teamed up to produce the 5th Annual GSN Sustainability Awards. The GSN Sustainability Awards program recognizes efforts that positively impact sustainable business in the spa industry and contribute to a vital future for people and the planet. This year's achievements will be awarded in 9 categories ranging from Green Building and Culinary Excellence to Sustainable Manufacturing and overall Spa Sustainability. Nominations will be accepted through June 15th, 2016 and can be submitted through the GSN website at http://www.greenspanetwork.org. Any individual, company or product related to the spa, health and wellness industry is eligible. The 2016 GSN Sustainability Awards Gala Reception will be at Devil’s Thumb Ranch in Colorado on Tuesday September 27th, 2016. GSN is a not-for-profit association dedicated to promoting sustainability in and through the spa and wellness industry. Their mission is to promote the vital connections between personal wellbeing, economic sustainability and the health of our planet. Through networking, education, and innovative best practices developed with its membership of the nation’s most innovative green spas, GSN is setting the standard for social and environmental sustainability in the industry. For more information, visit http://www.greenspanetwork.org.